As a window installation contractor in Jacksonville, we understand that Florida weather can be temperamental, to say the least. By being so close to the coast, residential homes are likely to encounter extreme weather conditions, such as heavy rains, unexpected hail and high powered winds. When storms or hurricanes like this occur, we at Ace Door & Window want you to feel confident that your home will remain protected until the weather clears. The hurricane impact windows we provide for your Jacksonville home ensure that your home has 24-hour hurricane protection. 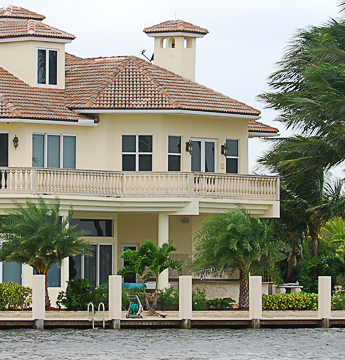 Hurricane windows are a viable alternative to hurricane shutters or storm panels. These forms of protection have to be put up on the exterior of your home, and removed when the hurricane has passed. Ace Door & Window installs hurricane resistant windows in Jacksonville that were originally created to resist extreme weather conditions with no additional support or fortification from other materials. This ensures that your home is prepared for any storm at a moment's notice. When hit by flying debris during a dangerous storm, our hurricane impact windows are designed to stay in one piece, ensuring the protection of your home against the risks of high velocity winds. The separate components that make up our hurricane resistant windows in Jacksonville are all important. Each portion of the hurricane window technology works with the other mechanisms to produce a level of performance that is tested and proven to protect your home in its greatest time of need. Protect your home with Ace Door & Window hurricane windows, installed in Jacksonville, Neptune Beach, Atlantic Beach, Jacksonville Beach, Ponte Vedra Beach, Arlington and Southside Jacksonville, Florida. Call (904) 438-3981 today! Don't forget to ask about receiving your free estimate!